WHEN Brisbane artist Antoinette Wijeyakulasuriya starts to paint she knows in her “minds eye” exactly how the finished artwork will look. 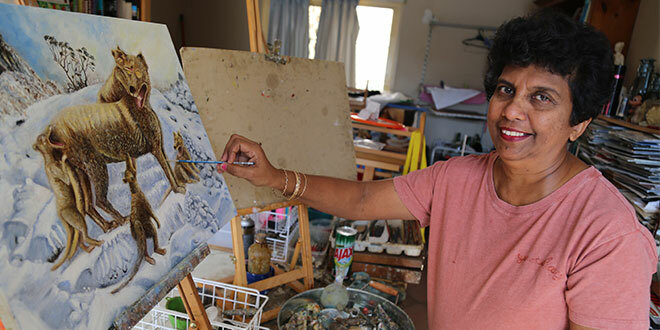 “The Holy Spirit is guiding me, and that is the joy of it,” Mrs Wijeyakulasuriya said from her home studio where she produces exquisite oil paintings that range from naturalistic landscapes to portraits and abstracts. Her acclaimed work, Holy Spirit, Living God, was selected as one of three Australian artworks for a worldwide exhibition in the Vatican to celebrate the Catholic Charismatic Renewal Golden Jubilee in 2017. This week she travels to Rome with her two grown sons to see where it now hangs in the Vatican’s international Catholic Charismatic Office. She describes the unique work as an outpouring of the Holy Spirit, and one of the high points of her lifetime passion for art, although she also finds time to volunteer at Brisbane’s Wesley Hospital taking Holy Communion to the sick, and with the St Vincent de Paul Society. As a child growing up in Sri Lanka, Mrs Wijeyakulasuriya was already identified as a talented artist and studied with one of country’s masters, the late Gate Mudliyar, who taught her the skills of classical painting. As a 23-year-old four of her portraits of the British royals – Elizabeth, Phillip, Charles and Diana – were presented to the Queen as she toured Colombo, and a Papal portrait was presented to the Vatican. Her artistic skills grew and blossomed with her faith, and after her family moved to Queensland. She has held many exhibitions and her portrait of Saint Mary MacKillop is on display at the Church of the Twelve Apostles, Jindalee. With her careful, intricate style, Holy Spirit, Living God, took a year to complete, but the inspiration for the masterpiece came to her quickly after a Friday night prayer meeting when she was asked to prepare a work for last year’s CCR Golden Jubilee. “I was excited but at the same time I was worried because I had no idea what I should paint,” Mrs Wijeyakulasuya said. “I silently asked God to help me…and He did. He will never fail you if you ask Him. “The next morning when I woke up everything came to my mind. I could see this image right in front of me; I just needed to put it on a canvas. “I could see this magnificent white dove representing the Holy Spirit. “The dove was spreading its beautiful wings protectively, over the whole world. “The message I got was that the Holy Spirit is there not just for a few of us but for the whole world, spreading His wings and protecting each and every one of us. “Then I could see this dark deep navy-blue background with little white stars. It reminded me of outer space. “ I could also see God’s love streaming down from heaven as rays of light. “Then came the rosary. I saw an amazing white rosary with a gold chain coming right down and resting on the Bible with two angels holding the rosary on either side.